This page brings together the best guitar tuners based on user reviews and value for money. There are some very expensive tuners out there but, as many experienced players will tell you, for every day tuning needs, most of them are an overkill. 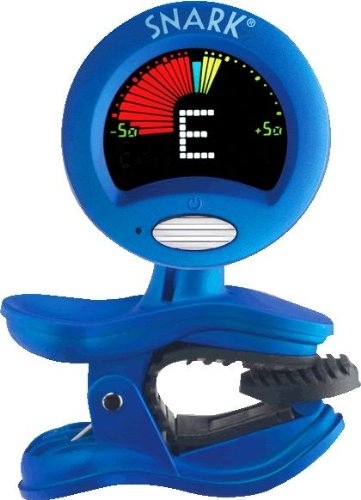 Whether you're looking for a clip on tuner, hand held tuner or foot pedal tuner, the picks below meet all the criteria you need for quick, clear and accurate tuning on stage, at home or on the road. Note that all the tuners featured below are chromatic (chron- being the Latin root for 12, in reference to the 12 musical notes). In short, that means you can tune any string to any note. It's actually hard to find a non-chromatic tuner these days and, when you do, the few bucks saving isn't really worth it. Remember, you can also tune your guitar online. If you're an acoustic player or just want the convenience of accurate tuning without plugging in, Snark offer the best value clip-on for the job. Responsive, crystal clear, flexible and with a built in metronome (for what it's worth), the SN-1 is seen by many guitarists as preferable to their standard hand held and even sophisticated pedal tuners. The Snark SN-1 has one of the clearest, brightest displays you'll find on a clip-on guitar tuner. The colour coding is simple but effective - flat tuning is indicated with a red arc to the left, sharp tuning with a yellow arc to the right and a central blue segment marks the tuned pitch. Below the arc is the note letter itself giving you all the visual reference you need. Users note the Snark is immediately responsive to the vibrations of your guitar and accurate with zero calibration time (this is where the indicator jumps around before settling to the current pitch). No harmonic interference as with some needle tuners. The circular display rotates 360 degrees, allowing you to clip it anywhere on the headstock without visual obstruction. The rubber grip ensures it stays put yet soft enough to not damage the headstock's finish/paint work. There are legitmate complaints about how easy it is to break the neck below the display, so Snark do need to work on a more sturdy design for the more... heavy handed of us! However, this does not seem to have brought the overal rating down significantly. Take care of it, don't leave it clipped on your guitar after tuning, and it should last as long as any other tuner. 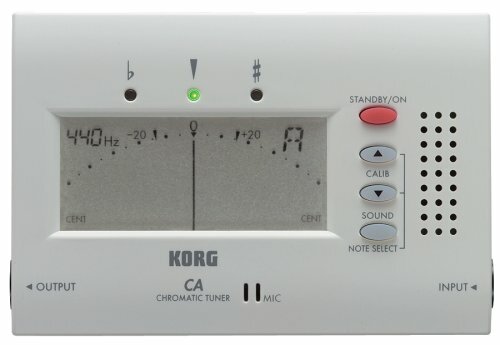 Developed from their popular CA-30 tuner, Korg's CA-40 is a consistant favourite among experienced players, many of whom have also owned top of the range tuners. Large display, built in pitch reference audio and microphone, custom calibration and several other features you probably won't use! Regardless, for the job at hand, it's the best value compact tuner at just under $20. More feature packed and robust than the Snark clip-on, which is to be expected. For the extra $10 you get an overall more sophisticated tuning device. It primarily serves as a line-input tuner, but features an internal mic for unplugged tuning, also useful if you want to quickly tune any other instruments in the same room. My bass player often has one of these sitting on his amp head and if I haven't brought my pedal I can tune from across the room no problem. Auto shut off means your battery won't drain when the tuner's not in use and the long battery life is confirmed by many user reviews. Another (possibly) useful feature is the "Sound Out" pitch reference which effectively acts as a pitch pipe and sounds the note you wish to tune to. Choose your notes and it will remember them for any future reference. The LCD display is more generous than most other hand held tuners, with a more traditional needle being the primary on-screen indicator which users generally found clear and responsive. Korg tuners are renowned for their precision and the CA-40 is no exception. There seems to be a lot of comment from people with a "tin ear" being especially impressed by the CA-40. The only gripe some users had was that the LCD doesn't have a backlight, so there's no illumination when on a dark stage, apart from the LED indicators above the screen (left red = flat, right red = sharp, middle green = tuned). As a result, it's more suitable for home, rehearsals and pre-gig rather than quick tuning between songs during a gig. Oh, and read the manual before use! If you're a gigging musician, you need a tuner with true bypass and clear, strong display for clarity in dark or glaringly light conditions. 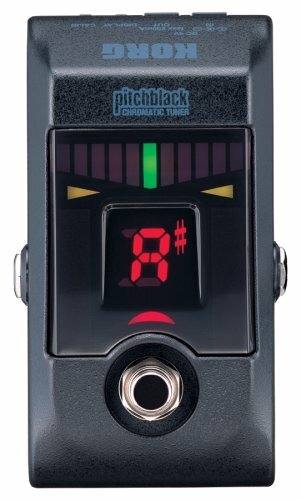 Korg's Pitchblack pedal tuner is designed for exactly that. It's every bit as good as (some even say better than) the Boss floor tuners... and it's cheaper! Designed for even the poorest lit gigs, the first thing users note about the pitchblack is its bright, easy to read display. No squinting or crouching necessary. The display is larger than most other pedal tuners thanks to Korg's minimalist, intelligently prioritised design. There are four display modes to choose from. The meter mode is what most guitarists will be used to - tune up or down until the light meets the middle and turns from red to green. The other modes include full strobe, half strobe and mirror mode, which are best demonstrated in the excellent user video above and on the Korg website. Users note that the Pitchblack's 100% true bypass makes it superior to the more expensive Boss equivalents, with no noticable noise or change in tone. Experienced users also claim it is more accurate than the boss TU pedals. Upon activating the tuner, your guitar will be silenced, so it also fulfills the role of a killswitch for those who need it. Its slim but solid build makes it perfect for the working musician who may already have a dozen or so pedals and needs a reliable tuner that will sit snugly anywhere in the chain. The 9V output means you can use the Korg to power other pedals on your board. Overall, brighter/clearer, just as accurate (+/- 1cent) and cheaper than its main competitors.